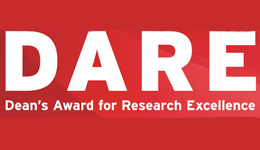 The first cohort of the Dean’s Award for Research Excellence (DARE) winners will showcase their exceptional work completed in the summer of 2018 and under the leadership of professors from the Faculty of Liberal Arts and Professional Studies (LA&PS). Dozens of student participants will attend the Sept. 20 event to present their research posters and engage with attendees. LA&PS launched DARE to provide opportunities for undergraduate students to engage in faculty-supervised research. This summer, 36 students each received $5,000 for their work over a four-month period. All are welcome to attend the DARE Research Poster Session and Celebration on Sept. 20 from 1 to 3 p.m. in the Second Student Centre’s second-floor lounge adjacent to the Convention Centre. Light refreshments will be served in the Convention Centre’s Room A2. Learn more about DARE in the YFile article “LA&PS announces winners of the Dean’s Award for Research Excellence 2018” and view the 2018 award recipients in the winners’ gallery.